This means no upcharges and just 10 business days to obtain CAL 133 compliant, ergonomic seating. CAL 133 is a standard of furniture flammability required by the California Bureau of Home Furnishings and Thermal Insulation. It specifically regulates the flammability of furniture that will be used in public buildings including government buildings, private offices, schools, universities, medical facilities, hotels, licensed child care facilities, prisons and more. Several states have adopted standards based on CAL 133. 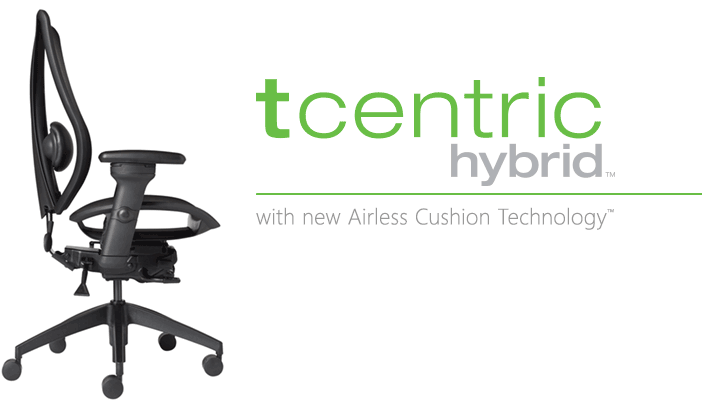 The tCentric Hybrid with Airless Cushion Technology combines the best attributes of the leading mesh chair with the industry-leading benefits of ergoCentric’s fully ergonomic upholstered chairs. You no longer have to choose between the sleek appearance and breathability of a mesh chair and great ergonomics. Now you can simply choose the tCentric Hybrid. * The tCentric Hybrid with an upholstered seat can also be specified to meet CAL 133 standards. Upcharges apply.